Shopping online for the best pipe benders can simplify the process of getting a great deal. But at the same time, you need to know exactly what you’re looking for. Choosing from the best tube benders available means first carefully considering how you intend to use it, the environment in which it will be used and so on. In some instances, the best copper pipe benders for basic DIY duties can be relatively simple and inexpensive. At the opposite end of the scale, the best hydraulic pipe benders can be incredibly sophisticated and carry a much higher price-tag. 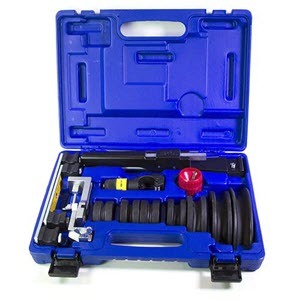 Just as it’s never a good idea to overspend unnecessarily, you also want to ensure you purchase a pipe bender that’s suitable for its intended purpose. So to help simplify the process at least a little, we’ve created a shortlist featuring some of the best pipe benders on the market right now. Each of the following has achieved top-seller status and earned widespread acclaim among professionals and everyday users alike. First up, the Hilmor 1926598 Compact Bender Kit with Reverse Bending Attachment goes a long way to prove that big things really do come in small packages. The pipe bender has been designed to deliver consistent results in even the most awkward working environments, with its convenient one-handed operation and ultra-precise bending attachments. The universal crossbar is supplied alongside a bunch of color-coded mandrels for quick and easy identification. Create quick and precise bends of 1/4", 5/16", 3/8", 1/2", 5/8", 3/4" and 7/8" tubing up to 90Degree or 7/8" mandrels. 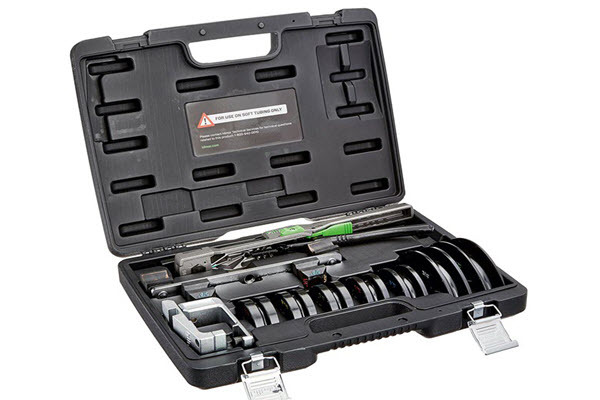 As the name suggests, the Hilmor 1926598 Compact Bender Kit also comes complete with a high-quality reverse Bending attachment for even greater versatility. Everything about the Hilmor 1926598 Kit focuses on simplicity and user-friendliness. The carry case itself is as impressive as its contents, storing everything away in a neat and compact package. Ideal for professional use and a great addition to the DIYers home toolbox, the Hilmor 1926598 Compact Kit pipe bender represents outstanding value for money. A great all-around kit and the number-one recommendation in our rankings. 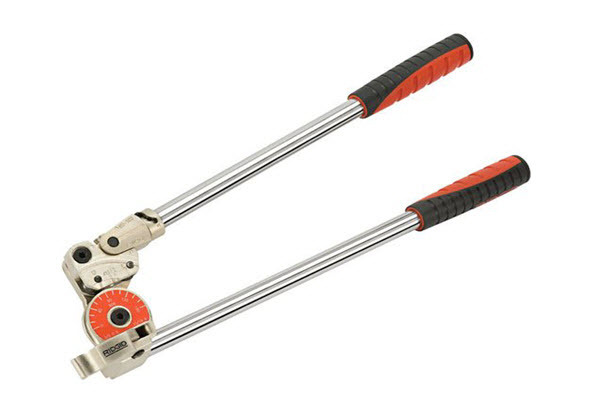 Next in line comes the RIDGID 38048 Model 608 Heavy-Duty Pipe Bender, which has impressive performance and rugged durability written all over it. 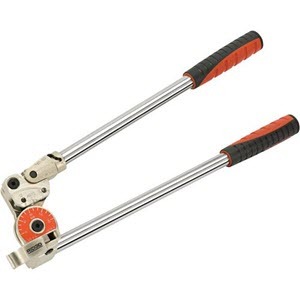 A simple yet highly effective device, the RIDGID 38048 Pipe Bender is capable of dealing with more challenging materials such as stainless steel and titanium. It also boasts a unique two-stage bending system, which allows for bends of up to 180-degrees to be carried out without crossing the handles. A simple twist of the bending handle locks the pipe in-place, after which the economic cushioned grips make for smooth and comfortable action. The RIDGID 38048 has been designed to maximize leverage and reduce force, helping to minimize fatigue with prolonged use. This tube bender has a 1/2-inch O.D. capacity and 1-1/2-inch bend radius, with generous 16-inch handles and a general feel of quality. Best of all, the RIDGID 38048 Model 608 Pipe Bender (and all other products from the brand) ships with a reassuring lifetime guarantee, which covers material defects and workmanship issues. The RIDGID 38048 Model 608 combines classic tube bender design traits with 21st-century advancements, resulting in an impressive and effortlessly tool that won’t let you down. 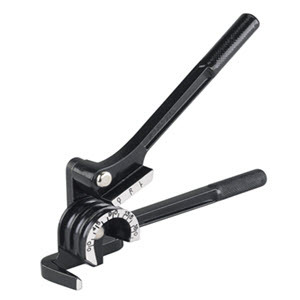 Sporting a slightly simpler design, the OTC 6515 3-in-1 180 Degree Heavy Duty Tubing Bender is nonetheless as versatile and user-friendly as it gets. Capable of making 180° bends in brass, copper, stell tubling, and aluminum, this one neat little bender is able to deal with pipes of three different sizes: 1/4", 5/16", and 3/8". Even when handling the hardest materials, the OTC 6515 3-in-1 Tubing Bender delivers consistently excellent results with minimal effort required. The OTC 6515 is a 100% no-frills affair, boasting little other than a sliding hinge joint and a basic metallic handle. All of which adds up to one of the easiest benders of its kind to get to grips with - ideal for professional use and home DIY projects alike. It’s proved particularly popular among mechanics and plumbers, creating smooth and kink-free bends with every operation. Once again, the OTC 6515 3-in-1 Heavy Duty Tubing Bender is a clever little tool that proves you don’t have to go to extremes to get the job done. If you’re looking for a simple, effective and incredibly affordable bender that’s compatible with multiple pipe sizes, this is it. 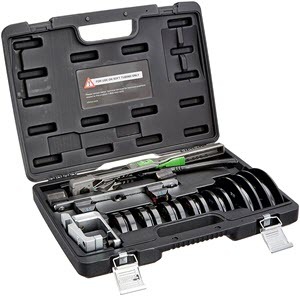 For the ultimate in convenience and versatility, the Yellow Jacket 60331 Complete Ratchet Hand Bend Kit takes some beating. True to its name, what you’re looking at here is a 100% complete hand bending kit that can deal with pretty much anything you care to throw at it. The gorgeous blue storage and transportation case includes everything you’ll need to quickly, easily and flawlessly bend 1/4", 5/16", 3/8", 1/2", 5/8", 3/4" and 7/8" tubing. The compact size of the bender makes it ideal for getting into places other benders would be unable to access. Quick-change bending mandrels and shoes further add to the convenience of the kit, which is robust enough for professional use yet simple enough for the home DIYer to get to grips with. Every component is manufactured from the highest quality materials and is guaranteed to go the distance. Yellow Jacket has earned a global reputation for producing and delivering impeccable tools at unbeatable prices. The Yellow Jacket 60331 Hand Bend Kit is standing as another impressive testament to the brand, which for the time being at least is on sale at an astonishingly low price. 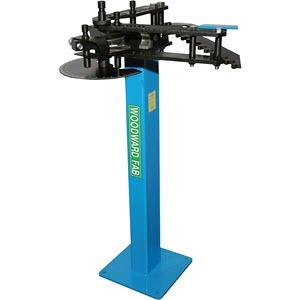 Taking things to a much more heavy-duty level, the Woodward Fab Tube and Pipe Bender is a firm favorite among discerning professionals worldwide. Manufactured with rough and rugged CNC machine components, this impressive piece of kit is capable of dealing with tubing of up to 2 inches in diameter. The lengthy 36-inch handle is designed to simplify even the toughest bends, reducing exertion and maximizing both accuracy and consistency. 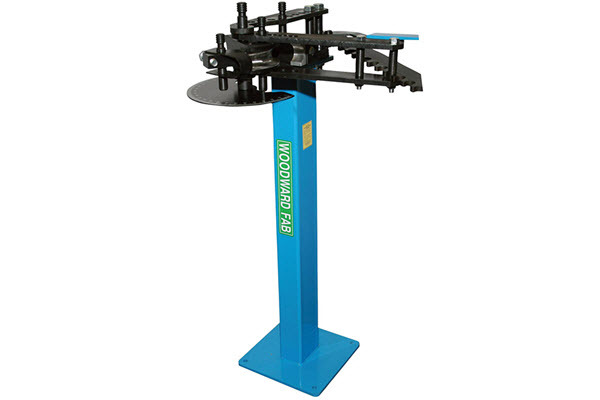 It’s worth noting that the stand featured in the image is an optional extra sold separately, though comes highly-recommended to get the best out of the Woodward Fab Tube and Pipe Bender. An incredibly powerful yet surprisingly user-friendly pipe bender that’s perfect for heavy-duty professional use. Though like all other entries in our listings, the Woodward Fab Tube and Pipe Bender WFB2 also represent an exceptional value for money. Rounding things off with another heavy-hitter from the world-famous brand, the Yellow Jacket 60325 Deluxe Ratchet Hand Bender Kit is a fantastic all-round kit at an unbeatable price. This high-performance package comprises everything you’ll need to bend 1/4″, 5/16″, 3/8″, 1/2″, 5/8″, 3/4″ and 7/8″ tubing with ease. 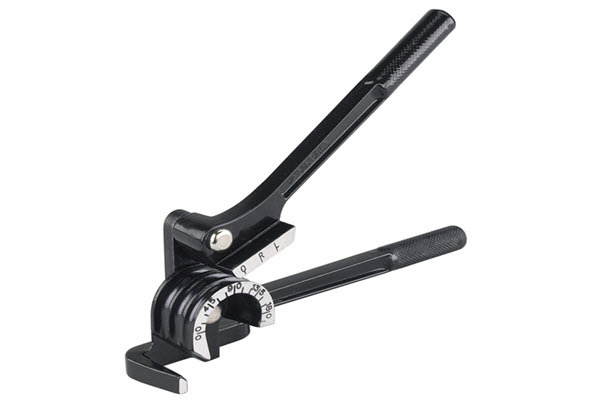 Quick-change bending mandrels and shoes further enhance convenience, as does the smooth and reliable ratchet mechanism. The Yellow Jacket 60325 Hand Bender Kit has been designed for effortless one-handed bending, dealing comfortably with materials as hard as copper or aluminum. Designed and manufactured in the United States, the Yellow Jacket 60325 also ships with an extensive warranty for total peace of mind. This compact yet comprehensive kit is ideal for professionals and first-timers alike, combining superb all-around performance with exceptional value for money. 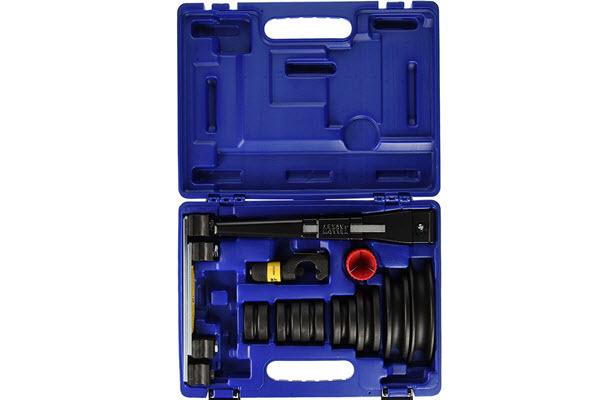 Whether looking to pick up your first pipe bending kit or upgrade to something of a higher quality standard, the Yellow Jacket 60325 Kit ticks all the right boxes. On the surface, buying the best pipe bender from the thousands of options available can seem like a real minefield. Unless you already have detailed knowledge of such devices, you might find it tricky to know where to start. In reality, it doesn’t need to be nearly as difficult as you may expect. Instead, it’s simply a case of considering your requirements and ensuring you select a device that’s capable of fulfilling them. Rather than choosing at random, it pays to think about your intentions and narrow things down accordingly. For example, you’ll need to think carefully about the type (or types) of material you intend to work with. If you need to bend tubing made from hard copper or titanium, you’re going to need a heavy-duty bender that’s capable of getting the job done. If you are dealing exclusively with soft copper, you’ll get away with something slightly less robust. The same also applies to the diameter of the pipe and the thickness of its walls. 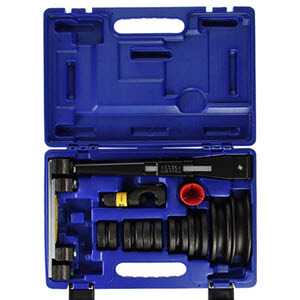 Don’t simply assume that any given pipe bender or pipe bending kit will ship with the attachments and accessories you need to deal with tubes of a certain size and thickness. Factor in the exact measurements of the pipes you’ll be working with and ensure the bender you choose is up to the job. You can also split the market for pipe benders into two distinct groups - manual benders and powered benders. For obvious reasons, powered benders eliminate the overwhelming majority of effort and exertion from the process. Nevertheless, you can also expect to pay a much higher price, and you’ll be looking at a much larger and more complex machine. If you need to bend the hardest and largest pipes in vast quantities on a continuous basis, it simply makes sense to go with a powered bender. 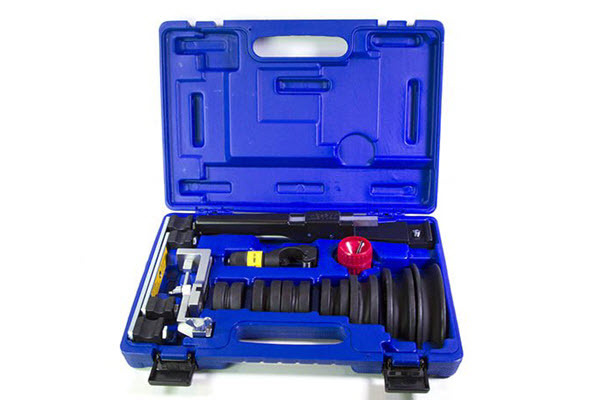 Choosing the best hydraulic pipe bender could save you time, effort and money long-term. But if you’ll be working with thinner pipes and softer materials on an infrequent basis, you’ll probably get away with a less advanced manual bender. If this is your first foray into the world of pipe bending, it’s advisable to consider investing in a complete kit. Rather than a single-purpose tool built to deal with just a couple of tube sizes, why not take home something more versatile? Some kits also feature a reverse bending attachment or function, which does exactly as its name suggests. Should an existing bend need to be partially or completely reversed, it’s as easy as creating any other bend in the pipe. It’s also worth considering where you intend to put your pipe bender to use. If you are working in a cramped and confined environment, you’ll need to opt for something as compact and convenient as possible. While some pipe benders measure no more than around 12-inches in length, others require several feet of horizontal space to operate. Last but not least, it’s important to understand that the quality of the pipe bender you buy will be reflected in the quality of the results produced. Pipe benders are available at a dynamic range of price points, but not every tool on the market delivers the same value for money. As a rule of thumb, be wary of any pipe bender or kit that’s practically being given away at a suspiciously low price. Likewise, steer clear of unknown brands you’ve never heard of, or anything that seems too good to be true. When buying tools in general, it pays to stick with top-rated and recommended brands with a reputation for delivering quality goods. In the case of pipe benders, household names like Yellow Jacket, Woodward and Ridgid all have long and established track-records for performing at the highest possible level. Buying from a leading brand also brings the added bonus of an extended warranty for total peace of mind.